ASTORIA — An environmental group is looking to help Astoria go green — by coating its rooftops in white. The White Roof Project is bringing its initiative to Queens for the first time next month. The nonprofit covers sunlight-absorbing black tar roofs with white solar-reflective coating to keep buildings cooler, cut energy costs and relieve stress on the power grid. "We've been really interested in working in Queens," said board member Heather James. "We're really excited to come to Astoria." Their first Astoria roof-coating will take place next month and is being funded by the U.S. Power Generating Company, which operates a power facility in the neighborhood. 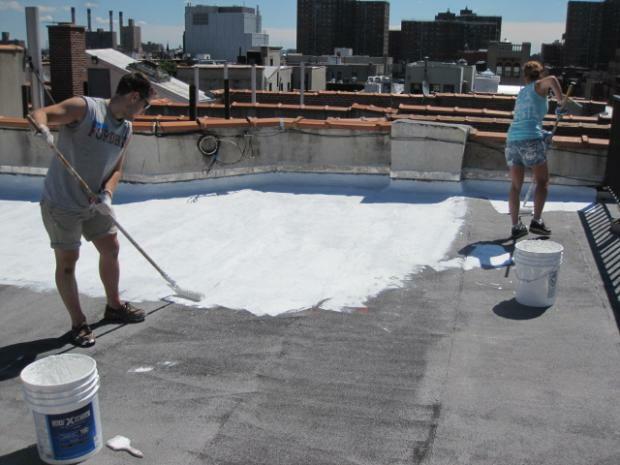 White Roof Project is working with Queens Community Board 1 and Councilman Peter Vallone Jr. to find a local nonprofit or affordable housing group that would benefit from the rooftop makeover, which can cut a building's energy costs by up to 40 percent. "We look for nonprofits and low-income buildings — they get the cost savings, the environmental impact, and they can really use the money for something else," James said, adding that they are looking to "identify needy buildings in hot spot areas where energy consumption is very high." The group white-coated 20 rooftops on the Lower East Side in 2011, a neighborhood they identified as one of the hottest in Manhattan. The white coating not only saves individual tenants money, but aids the whole city by reducing stress on the energy grid, lessening the likelihood of blackouts and so-called brown outs. Astoria was home to a massive blackout in 2006, when much of Western Queens lost power for a staggering nine hot summer days. "It's really important and sort of pertinent to think of different ways we can use less energy during the summer," James said. Nonprofit or affordable housing groups interested in working with the White Roof Project should contact board member Heather James at hjames@whiteroofproject.org.